SWEET CHARITY - Page one. I have been commissioned by this musical society to design and paint two 25 feet by 14 feet backcloths. (Central Park and a New York street scene) . I propose to let you, the web surfer, "watch" this project as it proceeds. (and also the production team and cast of the show, assuming they have been alerted). 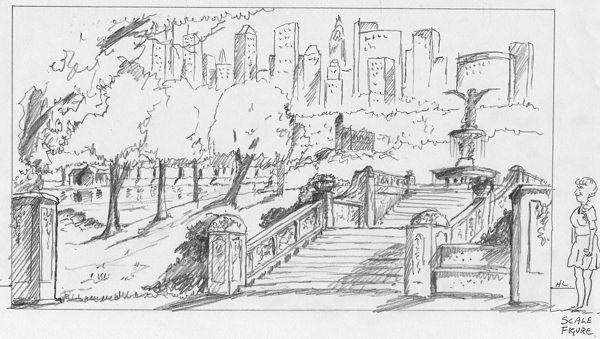 CENTRAL PARK - The first job was to discuss with the designer what elements he wants in each cloth. Time of year, daylight or night time, weather, any particular feature which must be included etc. Then there was lots of research using the Internet, guide books and holiday brochures. From which I then did this scaled pencil sketch which the designer and producer saw and aproved. Note small HL letters beside figure, this is my horizon line/eye line. Next task is to copy a grey version of the sketch, mark the main outlines in black ink and draw a one cm. grid over it. Now you can go in one of three directions.